Too many business owners stress over what their competitors are doing, when they would be better off concentrating on what their customers want. Campground owners are no exception. Probably the most common fear is having a rate structure that is higher than that of nearby competitors. One of the questions that I most frequently field – typically right after the first of the year – is “What do you see other parks implementing for rate increases?” The insinuation is that unilaterally raising rates will somehow lead to a mass exodus of campers toward the lower-priced parks. This notion presumes that camping is a commodity where decisions are solely based upon price, without regard for customer loyalty or the many features and amenities that differentiate one park – or one campsite – from another. That logic might apply to campers who are looking for nothing beyond the basics … the same customers who are not going to spend any money in your store or for added services, and who are the most likely to complain about everything from guest fees to your “no refund” policy. On the other hand, there is a growing and lucrative market of campers who are seeking out – and willing to pay for – little extras in their accommodations. Whatever the sites might be called, there is a growing demand for premium, premier, and super deluxe campsites. I reached out to the owners or managers of three parks that are noteworthy for fearlessly raising their rates on their upper tier of sites, and I asked them to share their thoughts on their experiences. We are all familiar with the aphorism that “a rising tide lifts all boats,” summarizing how everybody benefits from those who are willing to lead rather than follow. The entire campground industry can thank parks like these that have taken the initiative to lead rather than follow. 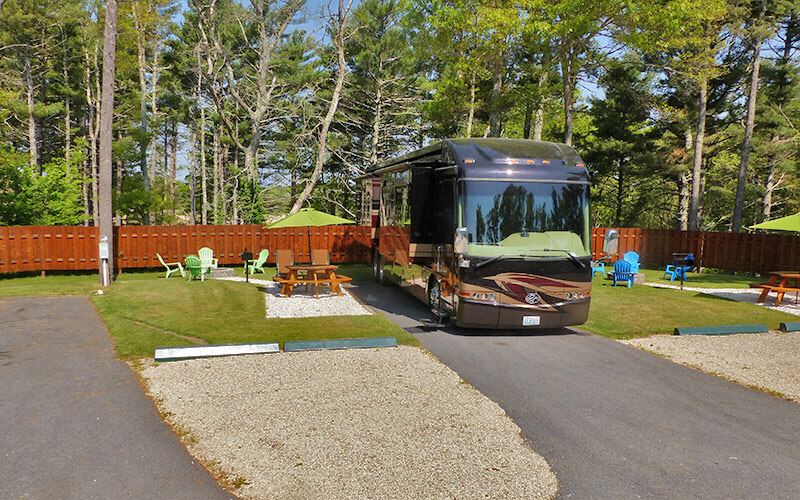 Wells Beach Resort is a family-owned and operated campground that is in its 48th season of business along the southern coast of Maine. Kevin Griffin commented how his father, Ken Griffin, began converting standard RV sites into premium sites about 30 years ago, as a means to better satisfy changing customer demands and raise site rates. According to Griffin, “It was a decision that we’ve never regretted, but at the time it was something of a risk, not knowing if the added premium site features (e.g., carpeted patios, 50 amp electrical service, larger parking spaces) would be worth the investment. We started converting sites slowly but were pleasantly surprised to discover that there was a very strong customer demand for upgraded sites. Weighing costs against benefits, we decided to accelerate the site conversion process over a span of decades. Today about one-third of our sites have been converted from standard to at least premium status. We also have a newer class of upgraded premium sites that we call ‘Premier.’ Our Premium and Premier sites have nightly rates that are approximately 10 to 20 percent higher than our standard RV sites, but the demand for upgraded sites is still greater than the demand for less expensive standard sites.” He concludes that, if park owners are looking for a way to make customers happy while simultaneously increasing their pricing power, upgrading standard RV campsites is definitely an avenue worth exploring. In his travels along the West Coast, Frank Merrick, manager of Black Bear Campground in the Hudson Valley of New York, had noticed the trend toward offering true 100-amp service at RV sites. Making 50-amp service available on two separate power pedestals or through two power boxes at one source at individual RV sites allows campgrounds to accommodate the largest of all-electric rigs, which are gaining in popularity. Merrick decided to offer a limited number of true 100-amp sites at his park, in an attempt to draw these larger, all-electric models to the area. These sites were created and offered at a premium price, approximately 10% higher than the existing full-hookup sites at the park. According to Merrick, “Results were positive as 2018 bookings began to increase, with a sizable percentage of new reservations requesting the premium sites.” As it turned out, only a few of these RV’ers had large, fully-electric rigs that truly required the 100-amp service, while most simply desired – and were willing to pay for – the larger sites that include this service option. Recognizing that opportunity, Black Bear decided to make these sites even more appealing by adding a few more features: a sod grass ‘back yard’ with rows of small privacy trees at either side, offering a bit more shielding from neighboring sites; two picnic tables per site, with a rock-lined pathway to the table in the ‘back yard’; and both a standard fire ring and a cemented iron grill at each site. According to Merrick, “the front and service area of each site was rocked with I9 for a comfortable spot to park an RV and any accompanying vehicles.” He added that “the rock also eliminated the need for grounds maintenance to mow or power trim directly next to a customer’s RV, lessening the possibility or occurrence of damage by the maintenance equipment.” Most of the items needed to upgrade these sites were already on hand at the campground, minimizing the cost of the aesthetic improvements, especially when compared to the number of bookings at the increased rates for these ‘Premium Sites’. Based upon the proven experience at these three parks, where management was not afraid to get ahead of the curve in offering guests premium amenities at a premium price, following suit in your park would appear to be a far less than risky venture. In fact, it is likely far riskier to maintain the status quo by continuing to market your park to a base of campers who make their decisions primarily upon price.